If you're a fan of the iconic musical duo, Indigo Girls, then like me, you have a version of yourself that you can't help but launch straight back to the very second you hear the first note of one of their vintage songs. For me, it's a sunburned, cutoff-wearing, 19-year-old version. If you're a fan of the iconic musical duo, Indigo Girls, then like me, you have a version of yourself that you can't help but launch straight back to the very second you hear the first note of one of their vintage songs. For me, it's a sunburned, cutoff-wearing, 19-year-old version. I was on the cusp of adulthood: impressionable, but also eager to make an impression of my own. The first time I heard an Indigo Girls song, I was working the night shift in a factory where I met a girl who was a hippie. That's what I thought of her then, anyway. She had wild hair and rings on her toes. She had strong opinions and was informed about social issues. She was so much of who I wanted to be. I was in awe. She pulled me out to my car one night and pushed a cassette into the stereo. Amy Ray and Emily Saliers' voices rose and fell in the most heart wrenching harmonies, and I felt every part of me climb into those lyrics. I didn't know then that the Indigo Girls had already established themselves as leaders in the LGBTQ community, and were also known for their staunch dedication to social justice. But I did know it felt like so many of those songs were written for me. And that's what it's like for fans of the Indigo Girls--especially women who were coming of age when those haunting songs of love, lust and loss were released. Ray and Saliers may have been writing their own personal stories, but those songs became our stories, too, and we know them, somewhere deep inside of us. 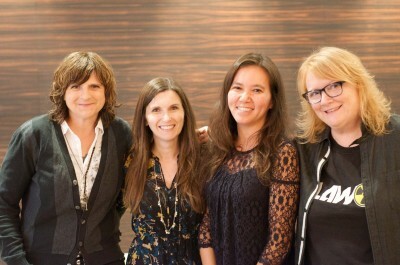 When I was invited to sit down to an intimate Q&A with the Indigo Girls at Roy Thomson Hall, ahead of their performance with the Toronto Symphony Orchestra, that's exactly what I wanted to know: Did you write those songs for us, or did you write them for yourselves? Saliers told us about the history of those songs that felt like ours. In the beginning, she said, they were for her. Like most of us who penned journals back in the day, they were written as notes to herself. And it made sense. Those lyrics captured so much of the bravery and uncertainty many of us felt at that time in our lives. And by allowing us to connect with those words, the songs let us write notes to ourselves, too. These days, so much of my energy is focused on the stories of others--in my role as a mother, wife, daughter, sister and friend. And I like to think I've grown and changed for the better because of it. Meanwhile, the Indigo Girls have continued to write songs and release albums, and I have continued to listen and sing along. I have found new ways to relate to their music, as they have evolved and found new ways to connect with their community. But there's one thing that seems to remain just as it was back in the early 90s, when I first discovered this new girl band with a unique new sound. More than two decades have passed and so much has changed but the songs from that early album has still held so many of us in their grip. And sitting in that room yesterday, while they sang a tune from back in the day, I realized what a gift it is to connect with music that marks a specific time in your life. When I hear those lyrics, I don't reimagine as I listen. I don't reinterpret their meaning so they will fit the woman I am today. Instead, those emotional words take me straight back to the 19-year-old who wanted to trade my khakis for cutoffs and toe rings. As soon as the familiar guitar strums and harmonies hit my ears, my heart reclaims that brave and uncertain girl. And I let them take me there, loving the feeling of return. You will dissolve all the stones that are cast. This is a peace that will take you higher. Together, in that room, we women sang like a chorus, all feeling the girls we were, the versions of ourselves from which we have grown, the version we've been given the chance to say meet again from another place in time. What music defined you? A band, a song, a set of lyrics? 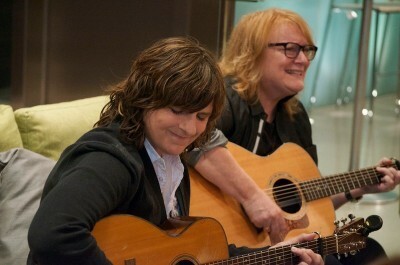 Get the Indigo Girls' 16th studio album, One Lost Day now. Follow the band and their stories on Facebook and Instagram. Written by Louise Gleeson and originally published on BrazenWoman.com. Louise blogs at www.latenightplays.com and can be found on Instagram and Twitter.